Knapp makes many contradictions in that interview. Also anyone who puts out a narrative without investigation or paying their dues as an investigative reporter / journalist are basically keyboard warrior's..... Essentially no-one else is allowed an opinion or to investigate so it would seem...unless of course your one of the new generation of bloggers (young guns) thay supports thr narrative, then thats OK! Bigelow et al have spent millions in the "search for the truth" Funny how they never release information then huh...in terms of verification we are supposed to take their word for it. I used to like George Knapp, some of his previous work was excellent, but someway down the line he compromised himself I think. Are they searching for truth? Or are they searching for a way to communicate? Trade follows learning to communicate. You ahould check out The Big Breakthrough. The whole Ron & Dan show is a soul sucking road to go down. I wouldn't recommend it. Lots of riddles, dead ends, mazes, in jokes, and pure dribble mixed in from outside posters. It saddens me to see my own posts from two years ago on that link. I was actually reasonably optimistic that some kind of revelation was imminent. Peter Levenda released a Research Journal concurrent with Gods. There is a lone entry on a page and I was wondering what people think he’s referencing here. 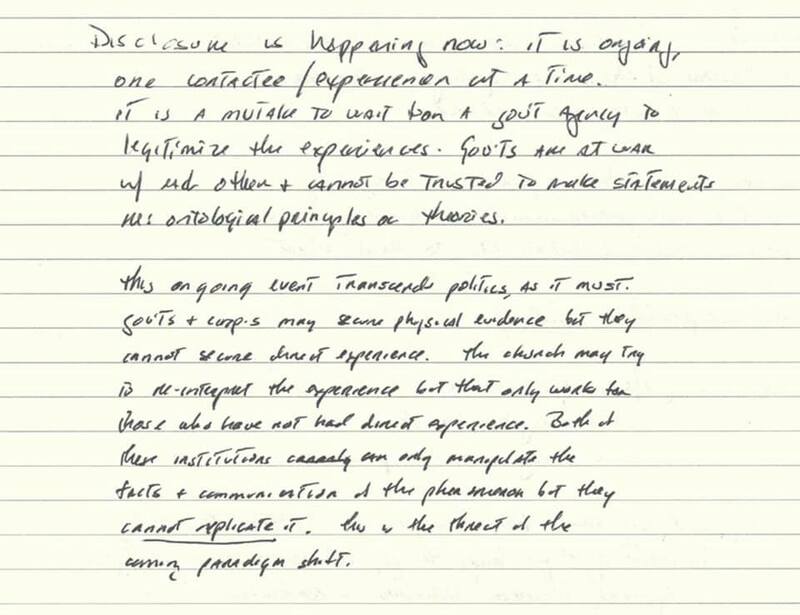 The long entry is the preceding page if you want some context to where it is in the Journal. The rest of the entry page is completely blank so the following page does not offer much context. What context does the “Mad Max” cover?